Phal. 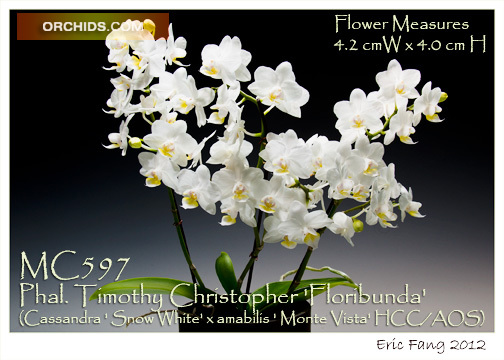 Timothy Christopher has been an amazing parent in multitudes of multifloral miniature hybrids and today is still one of the most sought-after of all multifloral Phalaenopsis ! This clone, ‘Floribunda’, is aptly named for its ability to produce multiple vigorously branching spikes of small pristine white flowers, each accented with golden-yellow in the lip. Although it tends to produce its flower spike from the center of the apical meristem, it will often continue to produce a new leaf or a basal keiki. 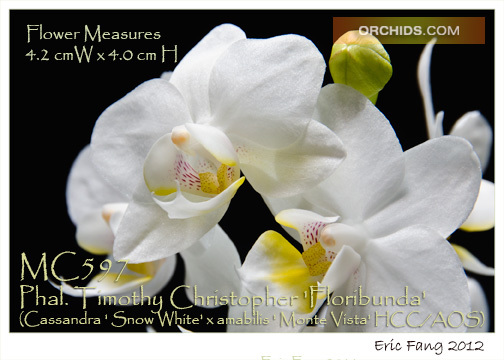 A very compact and easy grower, its floral abundance is reminiscent of a soft fluffy white cloud. 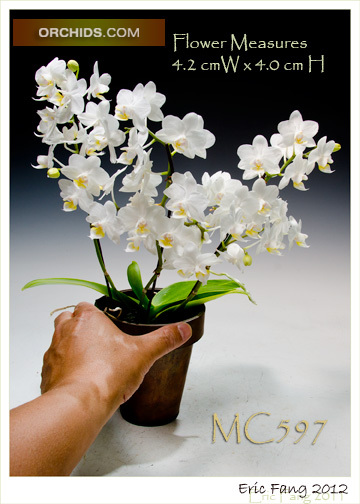 Ideal for under lights, windowsill or small space growing, it is Highly Recommended !